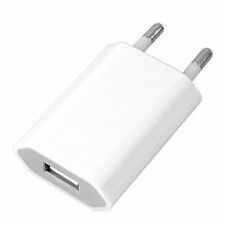 Samsung Original European EU- USB Phone Fast Charger Adapters Plug 2 Pin. 5 x Beauty Foundation blending Makeup Sponge Flawless Buffer Puff. 8 x Beauty Foundation blending Makeup Sponge Flawless Buffer Puff Multi. Retro Cast Iron OPEN HERE Wall Mounted Bottle Cap Opener Bar Kitchen Cola Beer. European 2 Pins USB AC Power Adapter EU Plug Wall Charger Mobile phone Ipod CE. 2x EU AC Plug. Suitable for i phone, ipod product. Compatible with Apple AC Adapters. We'd like to settle any problem in a friendly manner. We want to make sure you are happy with our item. Goods without RMA number will NOT be accepted. 2 X Samsung Original European EU- USB Phone Fast Charger Adapters Plug 2 Pin. Plug Type: EU Plug. 1 x 3 ports EU Plug. Compatible with most of the USB enable devices including Apple Iphone, iPod, Samsung, LG, HTC, etc. Protective circuit to prevent overcharging. High efficiency and low energy consumption. USB - Konica. USB - Sony. USB & Firewire. Travel Adapters. AA/AAA Travel Cases. Ex-Pro HDMI Wireless Transmitter Receiver Adapter Dongle. Wall Clocks. Security & Safety. Quantity: 1 EU Wall / 2 EU Wall / 3 EU Wall / 5 EU Wall. Built-in Circuit Protects Against Over Charging & Current Back Flow. LED power indicator. Build-in Smart IC chip can recognize a full battery and automatically switch to stand-by mode to protect your cell phone's battery from over charging. USB interface. Suitable for DVs, cell phones, MP3 players, PDAs and etc. Fully certified CE Approved and ROHS Compliant. What's in the Box:-. Weight 25g. 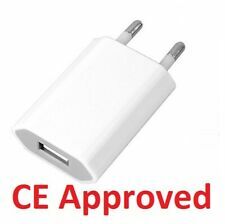 European DC5V/1A Fast Charge Mobile Phone USB Power Adapter EU Plug Wall Charger. We will despatch this item within 48 hours apart from weekends. Other Information. 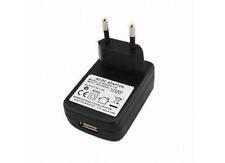 European 2 Pins USB AC Power Adapter EU Plug Wall Charger for smart phone -Black. Override protection: 115 to 200%vA, automatic recovery. Light and convenient plug in. Insulation resistance: ≥30MΩ, DC 500V. Output standard: 5V/2A. Insulation strength: 3000V AC/5mA, 1 minute. Maximum power: 10W. A European USB plug helps charge your non-European devices such as smartphones, tablets, GPS units, and MP3 players when you’re away from home. European USB adapters could also come with removable adapters for America, Australia, and the U.K., which makes them your ideal travel adapter. Get a European USB charger on eBay if you’re slated for a Europe trip. Are there different European plug standards? Type C: Popularly called the Europlug, this plug has two pins and is used in all European countries, except the UK, Ireland, Malta, and Cyprus. Type E: The Type E plug is used in Belgium, France, Slovakia, Czech Republic, and Poland. This two-pin plug is like the Type C plug and comes with a couple of 4.8 mm round pins. Type F: Commonly referred to as Schuko plug, which means safety contact in German, the Type F plug is used in Germany, the Netherlands, Austria, Finland, Sweden, Portugal, Norway, Spain, and Eastern Europe. Type G: The Type G plug is primarily used in non-Type C countries, which includes the UK, Ireland, Malta, and Cyprus. Type J: To connect to the electrical outlets in Liechtenstein and Switzerland, you need a Type J which comes with three 4mm rounded pins. Type K: The Type K plug is used exclusively in Greenland and Denmark. Will a European USB plug damage a non-European device? No. A European USB adapter works with devices that are made or sold in or outside Europe, it's just the plug standard that varies. However, the charging speeds may not be on par with your device's original charger, especially if the proprietary charger supports fast or quick charging and the third-party European charger doesn't. That said, the European charger would offer much better charging speeds than the power supplied by a laptop computer via USB. Is a voltage converter necessary? No. Most travellers assume they require voltage converters for charging their electronic devices in Europe. Generally, mobile phones, laptop computers, tablets, and camera battery chargers function in the 100V to 240V range. This encompasses the standards found in America, Canada, Europe, and several other countries and continents. Most work with varying electric frequencies (50Hz to 60Hz) so you won't need an expensive voltage converter.